1970's London: An old tramp carrying a hamster staggers into the road and gets hit by an oncoming vehicle. When police arrive on the scene, they are amazed to find that he is still alive. Victorian Britain: Sir Hugh Cunningham, scientist and philanthropist, discovers a strange blur while looking at the negative photographs of dying men he had taken. Later on, at a boating party, Sir Cunningham uses his new invention, a motion camera, to take pictures of his son and new wife, who are punting on the river. They have an accident and are drowned. He captures the whole event on his camera. Reviewing the film later, he notices the same blur on the moving frames. He makes the amazing discovery that the blur is moving towards the dying bodies and not away from them. 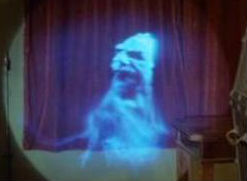 After some research, he realises that the blur is a Greek spirit called The Asphyx, a being which appears at a person's death to take them to the underworld. He deduces that if he can capture this spirit then he will have found the key to immortality. With his adopted son, he tries to develop procedures to capture the Asphyx and hence find the secret of eternal life! 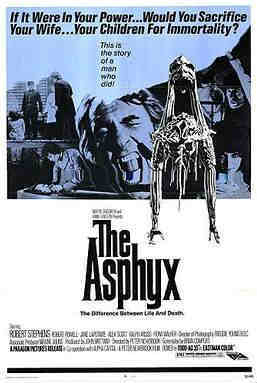 Britishhorrorfilms: The Asphyx is, as many Gothic horrors are when watched with modern eyes, painfully slow at times, but an enforced matchsticks-propping-up-the-eyelids watching does pay some dividends. Oh-the-horror: The Asphyx is a gothic throwback that’s rich in drama, shocks, and an elaborate mounting that gives an improbable dime store story an unexpected heft.